In last week's blog, I talked about our weapons of warfare and the fight we are called to wage in the Kingdom. I am continuing this thought this week by talking about a young shepherd boy named David. I'm sure we are all familiar with his life story, but just as a reminder, here's a brief overview... He was the youngest son of many sons to his father, Jesse. His dad must not have been too impressed with him because when the prophet Samuel came calling looking to anoint one of Jesse's sons as the future king, David wasn't even invited to the party. Yet it was the smallest and least significant of Jesse's sons that God had chosen to be the next King of Israel. Fast forward a few years of David living in solitude in a shepherd's field, with his only job being the protector of a few insignificant sheep. It was during this time, living under the open skies among these docile creatures that God trained David for battle. Probably armed with just a harp, his shepherd's staff and maybe a slingshot, David annihilated every predator that came his way. Fast forward a few years again to the time of this week's passage where Israel was at war with their arch rivals, the Philistines. Camped on two sides of the same valley, both armies were gathered together preparing for what would ultimately be one of the defining battles in Israel's history. The only problem was that the Philistines had a champion in a giant named Goliath, and Israel didn't. For 40 days in a row, this behemoth of a man stood before the encampment of Israel and struck fear into their hearts. He demanded a one on one showdown with Israel's finest warrior. But no one stepped up to the plate... until a teenage boy named David showed up on the scene delivering groceries to his brothers. I love the moxie that David displayed when he heard Goliath's taunting in 1 Samuel 17:26 when he said... Who is this uncircumcised Philistine that he should defy the armies of the living God?” (NIV) Even though the entire army was paralyzed in fear, this little shepherd boy was not intimidated in the least. He knew that the God who delivered him from both the bear and the lion would deliver Goliath into his hands as well (1 Samuel 17:31-37). I think David's willingness to fight on behalf of the entire nation of Israel further proves the Apostle Paul's point in 1 Corinthians 1:26-29 that says that God has chosen the weak, the foolish and the poor to confound the strong, the wise and the wealthy. Considering that King Saul was a head taller than anybody else in Israel, and the many professional soldiers that he had at his disposal, the thought of a little shepherd boy defending their honor is absolutely heart warming and completely opposite to who they would have naturally chosen. So here comes the point of this week's blog... With the best of intentions, King Saul offered David his own armament to go into battle with. While I'm sure that this would have been a great honor for David to be given the best armor that Israel could afford, he had the wisdom to respectively decline. After all, another man's armor just didn't fit. Sure it was the best that money could buy. And of course it was a huge honor coming from the king, but the answer was still 'no thank you'. 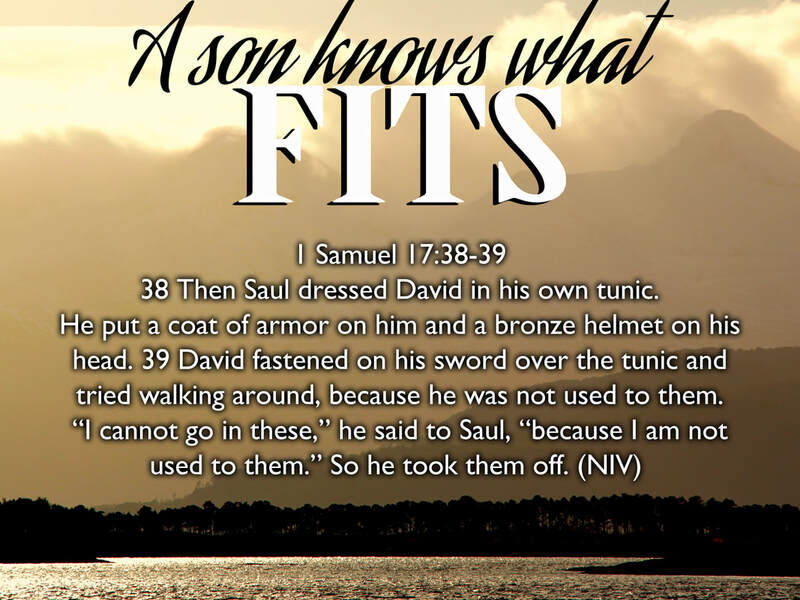 We don't know what carnal pressure King Saul placed on David to wear his own armor but we do know that David stood his ground and all of the Israeli army was glad that he did! David was happy to run wholeheartedly towards the biggest, baddest, most ferocious enemy on the planet with only 5 smooth stones and a slingshot. Oh wait, he had one more thing... He knew without a shadow of a doubt that the Lord of Hosts was with him, and that's all he really needed. It is no surprise that Goliath was offended by the young, under armed boy that Israel sent out as his equal. His feeble attempt at cursing David lasted but a moment until one of those insignificant stones found its way implanted in the very center of his skull. The rest is history. Goliath lost his head over the deal, the army of Israel overran the Philistines and David won the hand of the daughter of the king. The moral of the story? Never underestimate the training that you have received from your Abba in the seemingly insignificant shepherd fields of your life. And don't measure your influence and your effectiveness by the broken world system around you... Whether within the walls of the church or without. And the next time some well meaning person offers you their own armor (gifts, talents, opinions, goals, personal convictions, passions, values, theology, ambition, etc.) to fight YOUR battle, politely decline and just be yourself. Who knows what giants might fall at your hands when you simply wield the unique weapons that you were trained with?